Clearing snow away from your home's foundation can help you prevent water damage to your basement, or other rooms in your home. Basements are one of the rooms most prone to water leakage issues. To pr...	event water damage, clear out your gutters on a regular basis to assure that rainwater is drained adequately from the top of your home. To prevent water damage, clear out your gutters on a regular basis to assure that rainwater is drained adequately from the top of your home. 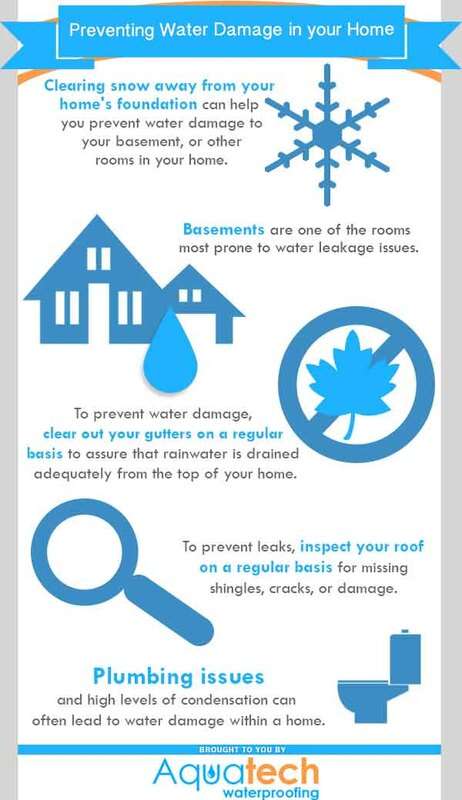 To prevent leaks, inspect your roof on a regular basis for missing shingles, cracks, or damage. Plumbing issues and high levels of condensation can often lead to water damage within a home. This infographic has been brought to you by Aquatech Basement Waterproofing. Is water invading your home? If so, you aren’t alone. Millions of homeowners struggle with water-related issues every single year. Luckily, Aquatech Waterproofing is here to help. They offer complete waterproofing solutions to homeowners throughout the Greater Toronto area.